Discussion in 'Boxing' started by werewolf, Jul 15, 2017. He looked very impressive. I think they said he holds the record for number of punches thrown in a round by a heavyweight. I don't know if he is one of the pawns for Al Haymon or he is a long shot/diamond in the rough prospect for Dibella. If he is aligned with the PBC he may have the inside track to Wilder down the road. Thanks for the reminder, WIR. These two fighters are good examples of how we should look very closely when evaluating fighters and not dismiss them too quickly because of their "look". From a glance Kownacki looks doughy, soft, wobbly, with minimal skill like some pub doorman -but he's not. His three main assets are his durability (not just his chin), punching power, and how he minimizes his movement to conserve energy. His win over Spzilka was no fluke; Kownacki has a lot of scrap in him. Iago Kiladze looks like a young Wladimir with his light feet, long punches, accurate jab, use of range, and lean physique -but he's not. His record, 26-1, is almost the same as Gerry Cooney's, 25-0, when Cooney fought Holmes. The comparison stops there though, as Kiladze's record is full of easy-outs. Record or not, he's missing one of the most important ingredients to being a contender with the heavies: a dependable chin. He was flattened lights-out-pancake by a single shot from cruiser named Kalenga. 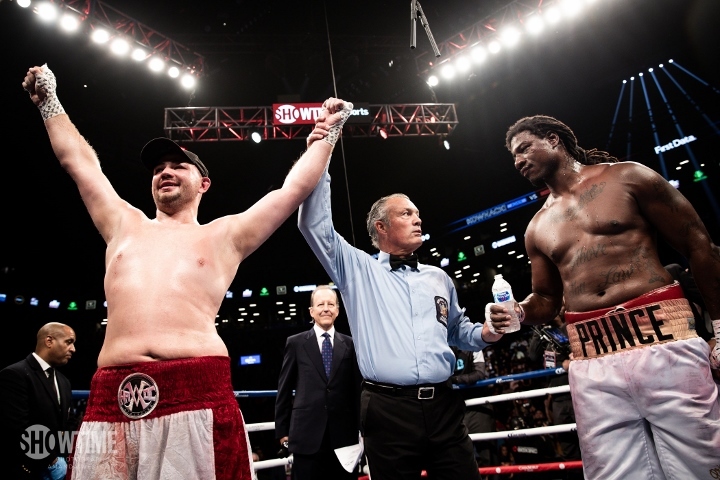 Kownacki wins by stoppage; Kildaze moves down the bench. Both are good sportsmen though. Yes if you read between the lines Adam is the house fighter so this fight is set up for him to win, you never know Kildaze could box his ears off but like you said "skinny" heavyweights who have been lights out knocked out in the cruiserweight division usually aren't sturdy enough to survive a big bomb on the chin in the heavyweight division. This fight could play out similar to Fury vs Cunningham where the naturally smaller guy has success early but is slowly ground down and stopped in the middle to late rounds. Cooney could have and should have beat Holmes. I'm still upset at that. There was a black NYC radio guy in NYC at the time who talked about boxing a lot, Art Rust Jr. He was a big Cooney fan and he said the same thing. Kownacki has a Facebook page. I think he'll have the fight shown on there, or linked on there. He says it is 7PM ET today. Links may not be that easy to find. Possible links you know where in ~ an hour. It happened already and like Ambrose and I suspected the Ukranian import fell apart after a few rounds of out boxing Kownacki. He actually sagged to the ground similar to Klitschko but Wlad always rose from these knock downs, he stayed down like a leveled building. Hope Adam Cowrustler comes in better shape next time and drops that roll he carries half way up. Bubba Bellew is ranked 5th by Boxrec and I think Cowrustler could make a fight with Bellew a real head-to-head horn locked battle. Yes I read he was Ukrainian, but he is a Ukrainian national and is ethnic Georgian. The name doesn't really sound Slavic. Thanks for the link. It still works. He looks (European) Georgian (I recently watched a subtitles Georgian movie about an ancient fairy tale of theirs - very good) and it says Kiladze was born in Georgia but now lives in Bklyn like Kow. The idiot endlessly babbling English language commentators are why I much prefer to watch fights in foreign languages that I don't understand. 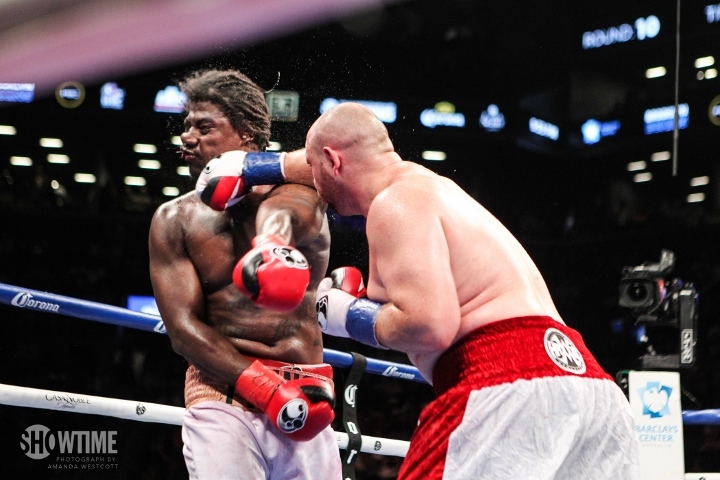 Kow's stock went down some in this fight tho way up in the Szpilka fight. He shouldn't be putting back on weight, 18 pounds. he was once over 300. Trim down and improve his defense and he could be championship material. 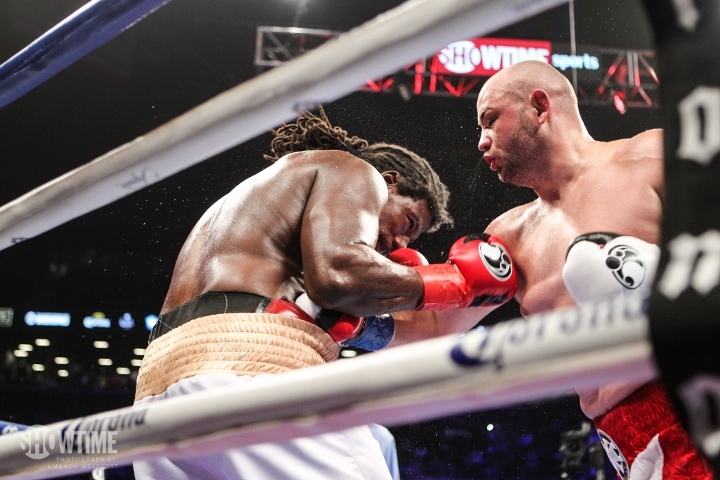 He made much quicker work of a common opponent, Spilka, than did Wilder. Trimming down is doable. It just takes will power. Don't eat all those pirogis on your plate. You can learn how to have a better defense. That's doable. But punching like he does is something you cannot learn and neither is taking a punch like he does. Kownacki clearly beat Martin tonight, but likely would have won by stoppage he hadn't slowed down in the later rounds. 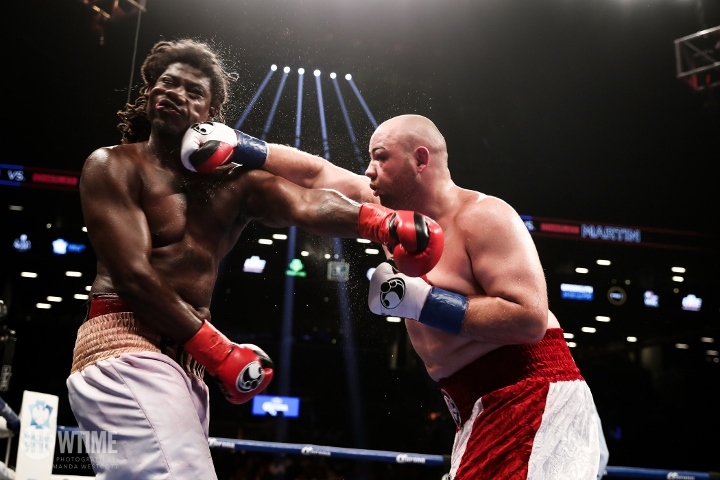 Disappointingly, Adam came in 21 pounds heavier (263 lb) than he was in his more impressive performance against Szpilka (242 lb). He looks like somebody who got bullied in school. His opponents see him across the ring and think "I got this." Then they find themselves in a hell of a fight. Wow, he looks like the kind of guy you'd see hanging out in a bowling alley on the south side of Milwaukee, but he can really fight. The ugly duckling keeps on rolling, at this point he deserves at least an official title eliminator, if not a voluntary title defense but with the potential big money round robin with the big 3 heavyweights he may have to bide his time until the dust settles.